A.T. 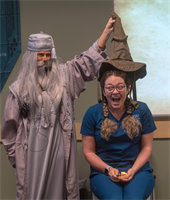 Still University’s School of Osteopathic Medicine in Arizona (ATSU-SOMA) recently hosted Hogwarts Day, a creative event designed to ease students’ stress while they prepared for final exams. ATSU-SOMA faculty, led by Victoria Bryant, PhD, assistant professor of genetics and molecular biology, planned Harry Potter-themed activities, décor, and costumes. The magic began early in the month, when ATSU-SOMA students received an acceptance letter to the “ATSU-SOMA School of Witchcraft & Wizardry.” On the day of the event, students were divided into four houses: Gryffindor, Slytherin, Hufflepuff, and Ravenclaw. True to the magical world of Harry Potter, they even donned a sorting hat for the ceremony. The houses rotated through stations that aligned magical subjects like potions and care of magical creatures to relevant material on upcoming final exams. Faculty members dressed up as famous characters from the books like Albus Dumbledore, Mad-Eye Moody, and Severus Snape. ATSU-SOMA Dean Jeffrey Morgan, DO, MA, FACOI, CS, dressed as minister of magic, Cornelius Fudge. In the afternoon, the houses competed in a Quidditch tournament, involving broomsticks, quaffles, and a golden snitch. Team Gryffindor won the coveted Quidditch Cup. The event was a huge hit with ATSU-SOMA students. The event was about more than Polyjuice Potion, boggarts, and butterbeer. The activities reinforced important academic concepts that will help students succeed on final exams and beyond.